Hey guys! I can’t begin to tell you how excited I am right now, but scared at the same time. 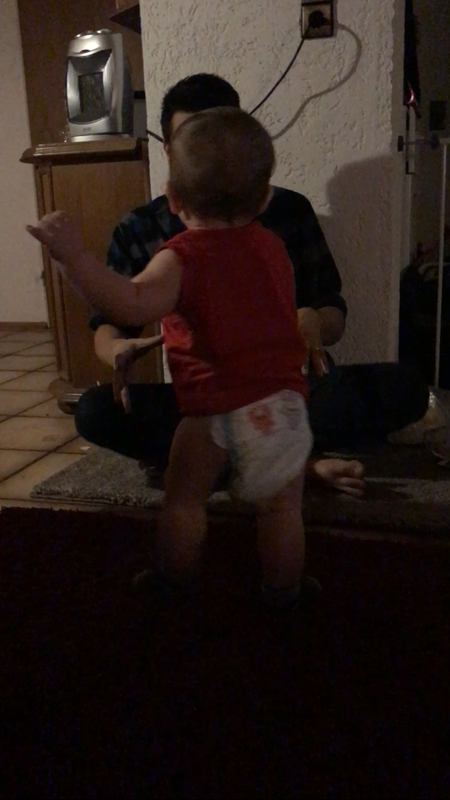 My baby boy can walk! I mean he can walk guys! As long as he is already standing up he walks so well. We’re getting him use to walking with shoes too. I’m so proud of him, he’ll fall down every so often but he’s getting the hang of it. He still has to learn stand up with no help but I’m in no rush for him to grow up any faster 🙂 The other night we were getting him ready for a bath and he was standing against the door. All of a sudden my husband said babe grab him. I looked over and the little man was walking out of the bathroom toward the stairs! I don’t think I’ve ever dropped something and ran so fast in my life. He was laughing and I’m thinking in my head that could’ve been very bad. We learned very quick all doors are shut when he’s in the room. I can’t believe he’s growing up so fast though. I’m learning to enjoy every little moment there is with him. Hey guys! Sorry it’s been a bit since I’ve posted something. My family and I were traveling back to the states. It’s been a year and a half since we’ve been home and nobody in our family has met the little one. Let me tell you though I missed home so much. My brothers finally got to meet my son and the youngest loves him so much. My youngest brother is like me when I was around him when he was first born. He wants to love him and hold him all day long. Being home after a year and a half makes you appreciate your time with your family more than if you were there everyday. You know most people today are so hung up on technology, wanting what everyone else wants and wondering what everyone else is doing, they lose sight of what really matters; family. Family is going to be that one thing that’s always going to be there, no matter how annoying they may be, no matter how bad their decisions may be, they will always be there. While on vacation I will continue to post but there may be longer periods in between than usual. Love your family, take time for them and yourself and make sure you make every minute count.